Combined Sewer - Sewer pipes designed to collect both sanitary wastewater and rain water runoff. Construction of combined sewers was the accepted practice from the early 1900s until the early 1970s when the Clean Water Act was passed and the Environmental Protection Agency was created. Combined Sewer Overflow - When it rains, combined sewers do not have enough capacity to carry all of the combined wastewater (sewage) and rain water to the Water Pollution Control (sewage treatment) Plant and/or the Plant does not have enough capacity to accept and treat all of the combined sewage. The combined sewer system was designed so that in these situations some of the combined sewage could be discharged into the nearest body of water – in Fort Wayne’s case one of the three rivers – creating a combined sewer overflow (CSO). Consolidation Sewer - A near-surface sewer that will be constructed to collect sewage from several existing sewers that will direct sewage to a drop shaft that connects to the deep rock tunnel. Construction or Open Trench - An excavation typically deeper than it is wide, dug to allow a sewer pipe to be constructed. An open trench is the typical construction method for near-surface infrastructure. Once the sewer pipe has been placed in the trench, the trench is filled with material that will hold the pipe in place – often called bedding material. Then the trench is filled with topsoil and planted with grass or restored to a condition similar to that which existed before the trench was dug. Cutter Head - The round structure attached to the front of a tunnel boring machine that holds smaller cutting wheels. Dewatering Pump - A pump that removes water. 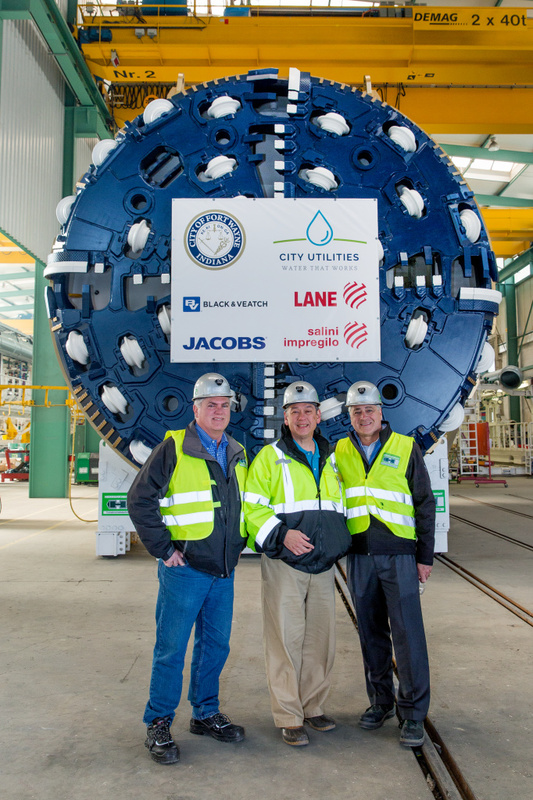 In the case of the Tunnel Works, a 30 million gallon per day (MGD) dewatering pump station will be used to drain wastewater from the tunnel after the tunnel is used during a wet weather event. During large rain events, most of the wastewater collected in the tunnel will siphon from the tunnel into storage ponds near the Water Pollution Control Plant. The wastewater that cannot be pushed to the surface through the action of the siphon will be pumped to the surface by dewatering pumps. Drop Shaft - A four to eight feet diameter, vertical shaft that will provide the connection between near surface sewers and the tunnel, allowing wastewater to drop to the tunnel depth. Near Surface Sewers - The system of sewer pipes and related structures located underground that may be within a few feet of the surface or as deep as 20 to 30 feet below ground. Other non-sewer infrastructure located near the surface may include water lines, gas lines, buried electrical lines, fiber-optic cable and other buried utilities. Outfall - The location where a flow from one drainage or sewer system enters into a larger system or into a body of water such as a creek, river or lake. Pump Station - A structure containing pumps and piping, valves and other mechanical or electrical equipment for pumping water, wastewater or other liquids. Regulator - A configuration of pipes within the combined sewer system that directs sanitary sewage to the Water Pollution Control Plant when it is not raining. When it rains, a sewer system regulator functions to direct as much combined sewage as possible to the WPCP for treatment while allowing some of the combined sewage to be diverted to a river (or to the tunnel in the future). By allowing combined sewage to be discharged from the sewer system or directed to the tunnel in the future, regulators help protect the Water Pollution Control Plant from being overloaded and help to reduce the likelihood of street flooding and basement backups. The regulator may consist of a weir in a sewer line. Retrieval Shaft - The location where the tunnel boring machine will complete its approximate 5 mile-long journey and will be dismantled and brought to the surface. Siphon - A means by which liquid is lifted from a lower level to a higher level using the pressure and weight of the liquid itself to push the liquid up. Liquid moving by means of siphon action does not require a pump. Tunnel - An underground pipe that provides transportation and/or temporary storage of wastewater. Tunneling is a construction method that involves little surface disruption. 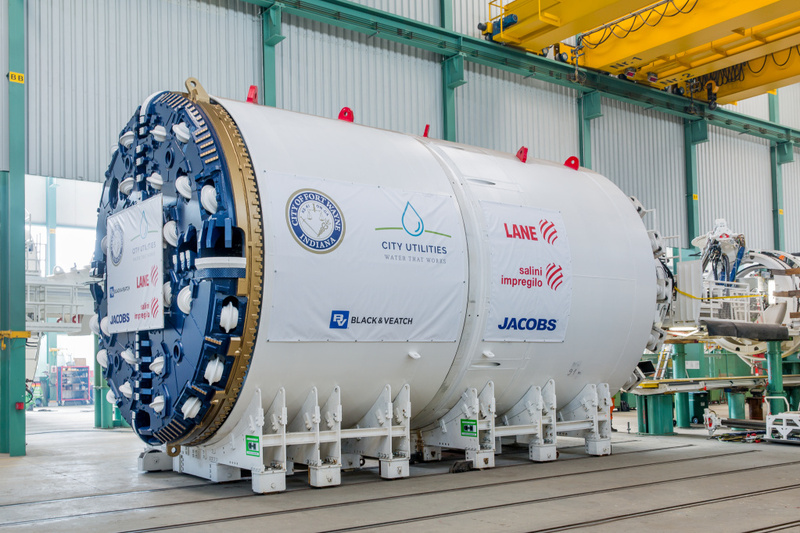 Tunnel Boring Machine (TBM) - A steerable machine with a round cutter head on the front and conveyors inside that cuts through bedrock and allows the cut bedrock to be removed from the back of the machine. The machine cuts a round tunnel through the rock that can then be lined with concrete or other pipe material. Water Pollution Control Plant (WPCP) - Also referred to as the sewage treatment plant, it is the facility that cleans and treats sanitary wastewater and combined sewage using various physical, bacteriological and chemical methods. The cleaned water that leaves the plant must meet a variety of federal and state water quality regulations. Wet Weather Ponds - Multi-million gallon constructed ponds where wastewater from the existing combined sewer system, and from the tunnel in the future, can be stored during wet weather. 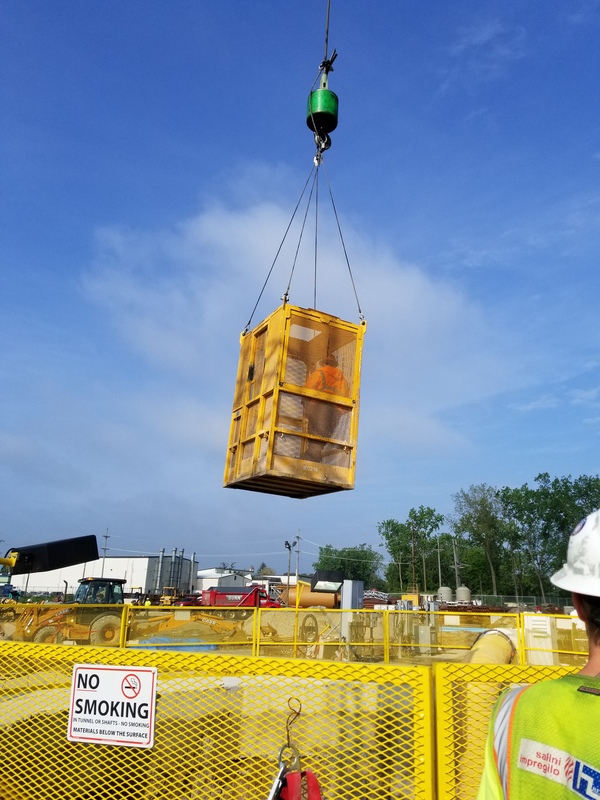 When the wet weather ends, the combined storage that has been stored in the ponds can be pumped into the Water Pollution Control Plant for complete treatment. Weir - a dam-like structure inside a combined sewer pipe located where two or more sewer lines come together that helps direct the flow of wastewater. When it is not raining, the level of wastewater in the pipe is below the top of the weir and wastewater flows to the WPCP. When it rains and the sewer pipe fills up, wastewater goes over the top of the weir. The flow that overtops the weir is directed into a second pipe and may be discharged to a water body as a combined sewer overflow. Once the tunnel is constructed, weirs will help direct sewage into the tunnel during most wet weather events. Working Shaft - The location at the water Pollution Control Plant where the tunnel boring machine will enter the ground to begin its five-mile underground journey.